The fine wine and gourmet cuisine of Franschhoek. A wildlife safari in 5-star accommodation. Cape Town in all its glory. This South African retreat is perfect for couples looking for an uncomplicated getaway, or families and friends looking for some exclusive time together. Welcome to South Africa! Our representative will greet you at Cape Town International Airport and whisk you away to the serene and sensual beauty of Franschhoek. You will spend the next two nights enjoying the hospitality of Leeu House. The currency of Franschhoek is that of wine, gourmet cuisine and luxury hospitality. Leeu Collection, comprising Leeu Estates, a 21-room five-star boutique hotel and winery, and Leeu House, a private five-star 12-room boutique hotel in the heart of Franschhoek village, deals exclusively in these. The Square is home to Marigold, the first classic Indian cuisine restaurant in the village; Haiku, offering modern Asian tapas-style fare; and Madira, a trendy bar and popular meeting place for visitors and locals alike. Set in the vibrant epicentre of Franschhoek village, guests can enjoy leisurely meals in The Conservatory, or al fresco on the terrace. Lunch and dinner menus offer delightful, innovative cuisine, prepared by the talented culinary team, headed by executive chef Oliver Cattermole. The individually styled bedrooms at Leeu House Grande Suites feature superbly comfortable beds with high quality linen, and are fitted with sisal carpets, and curtains and upholstery in natural linens, contributing to the relaxed yet sophisticated feel. The luxury en-suite bathrooms have marble floors, showers and double vanity tops, free-standing baths, generous showers, underfloor heating and heated towel rails. 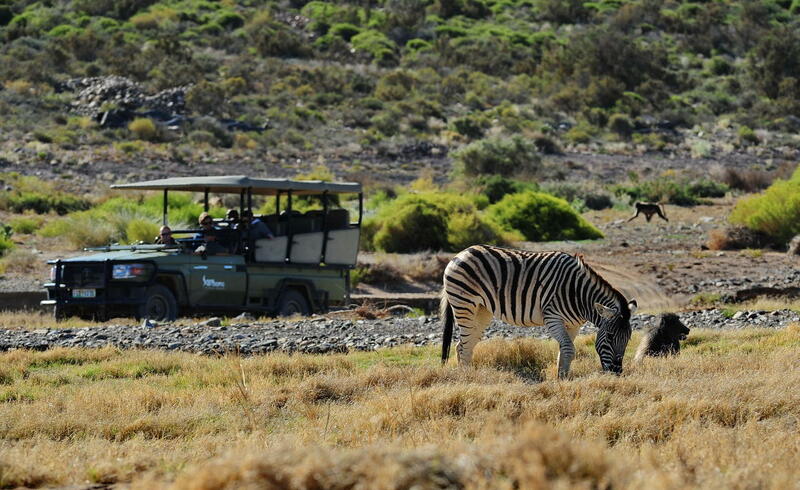 After your relaxing time at Franschhoek, it is time to head out for a wildlife safari in the Sanbona Wildlife Reserve. Enjoy game drives in this wilderness sanctuary. Sanbona, often referred to as the ‘Arizona of Southern Africa’ and the spirit of the San people, invites you to explore a special wilderness sanctuary, offering five star accommodation at three luxurious lodges and a back to nature Explorer Camp adventure, surrounded by ancient volcanic mountains and endless vistas. Beautifully appointed tents exude an atmosphere of pioneering adventure in a vast and hidden landscape. 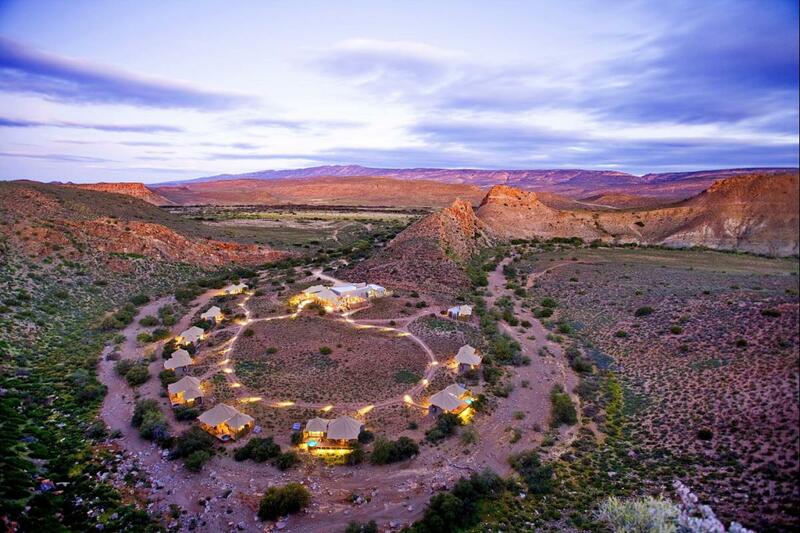 Dwyka Tented Lodge is surrounded by awe-inspiring rock formations which was once the home of ancient Khoisan hunters. Situated on a horseshoe bend of a dry Karoo ravine, the lodge with 9 luxury tents has a Relaxation Retreat, communal lounge with fireplace and TV, wine cellar and open air boma. This morning, after breakfast, you will be escorted to Cape Town, a city full of enthralling sights and sounds. You will spend the next two-days exploring the Cape Town. Your home for these two days is the Cape Grace Hotel, located on the Victoria & Alfred Waterfront. Cape Grace Hotel is located on V&A Waterfront. With a classically inspired exterior and graceful elegance within, the Cape Grace Hotel’s charm lies in its intimate atmosphere, stylish décor and personalised hospitality. Guests will find the staff warm and flexible with a spirit of unrivalled generosity throughout their stay. All 121 rooms have views of the Victoria & Alfred Waterfront and yacht marina with a Table Mountain backdrop. The creative energy that inspired the locally-infused design enhances the elegant ambience that has made the hotel an iconic landmark and perfectly placed to access the airport, city centre and popular tourist destinations. The Signal Restaurant offers unique locally infused combinations of mouth- watering dishes that reflect the many cultures which helped to shape Cape Town’s heritage. On the water’s edge of the yacht marina the Bascule whisky, wine & cocktail bar is the perfect setting to take in the sights and sounds. There are over 400 whiskies from around the world and an impressive selection of the finest Cape wines on offer, by day or by night. This tour begins and ends in Cape Town. The best thing about this itinerary is that everything is in and around Cape Town. No additional flights are required. If you are looking to plan a trip to Africa, look no further. Contact us for more details regarding this South Africa tour.